Therefore, the cycle network must be user focused, addressing the 5 Needs of the Cyclist and providing a sufficiently high Quality of Service. 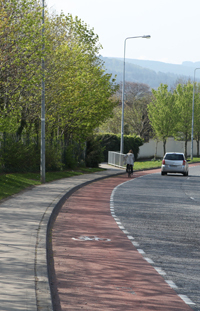 The Cycle Network should address the 5 Needs of the Cyclist. The first three needs, namely Safety, Coherence and Directness are considered central to network planning. Comfort and Attractiveness are not considered as significant factors in network planning, but remain important requirements at route and link level. Directness is the most important requirement for network planning. 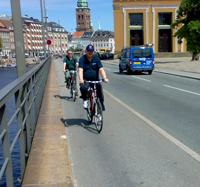 Because of the effort and time involved, cyclists are highly intolerant of detours and additional journey length, etc. Major trip patterns should be as close to “as the crow flies” as possible. It is recommended that the designer prepare a Map of the Quality of Service (QOS) for the cycle network. Ideally, for routes serving primary destinations, the QOS should increase closer to the destination. The highest QOS should be in the immediate vicinity of the primary destination itself.